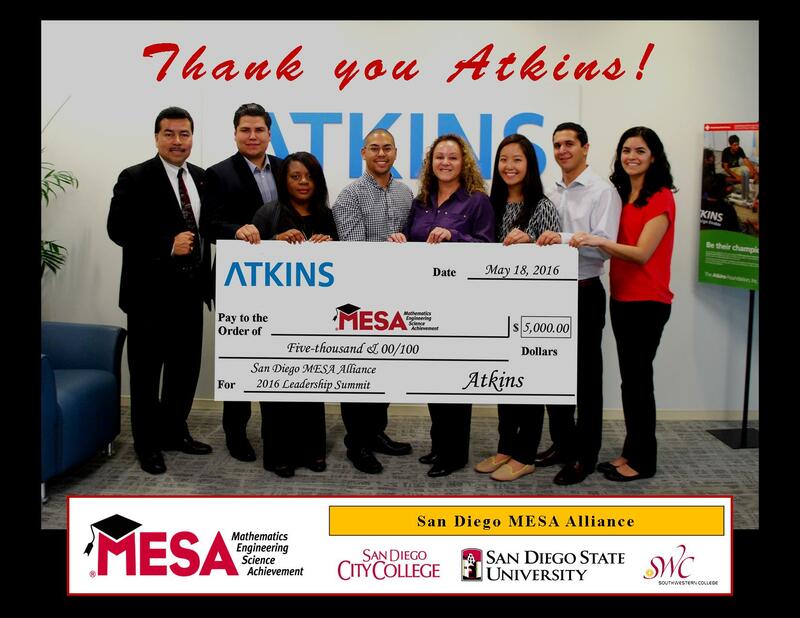 Atkins Global Inc. presented a check for $5,000 to the San Diego MESA Alliance to benefit the MESA Leadership Summit. The MESA Leadership Summit is an annual weekend camping event with an agenda of seminars, workshops, and group projects designed to develop the leadership, communication, and presentation skills of engineering/physical science students. MESA is nationally recognized for its innovative and effective academic development program, engages thousands of educationally disadvantaged students from middle school through a four-year college program, and provides support through classes, hands-on competitions, counseling, and transfer support to help students excel in math and science and graduate with math-based degrees. MESA partners with industry and all major education institutions in California. Atkins (www.atkinsglobal.com) is one of the world’s most respected design, engineering and project management consultancies, employing over 18,600 people across the UK, North America, Middle East, Asia Pacific and Europe. We build long term trusted partnerships to create a world where lives are enriched through the implementation of our ideas.